Kingfisher and canal — Rooted to the Moment. 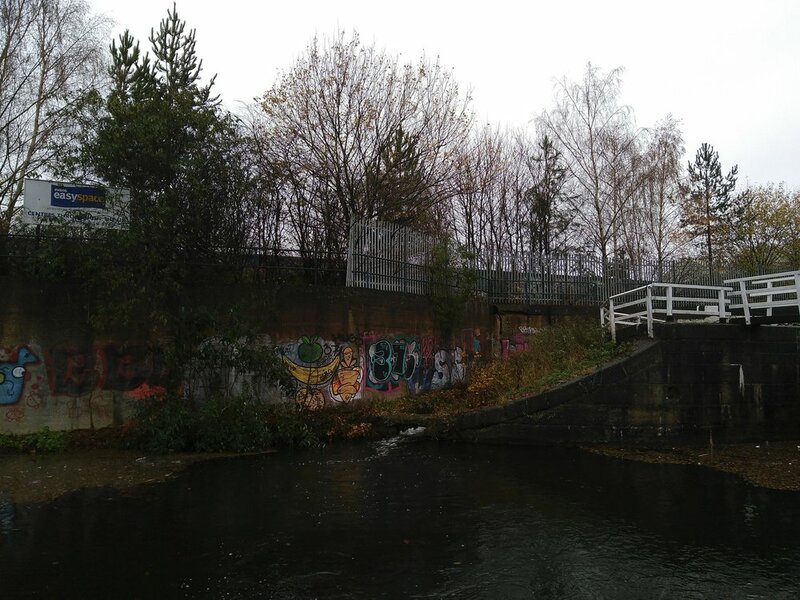 Canals lie in the grey area between natural and built spaces. By definition they are a constructed feature, but as water and time have flowed through their channels they have brought with them wildlife and character from the natural realm. On this canal, with industrial Yorkshire heritage, I can see the natural and the man-made blending before me. This is perfectly illustrated in the graffiti by paint and by bird that decorate the same walls. The drizzle is coming and going as I wander along the towpath once trodden by workhorses, under a grey sky. My jacket flaps in the funneled wind. I keep a steady pace to calm my pram carried companion. Biking commuters ding and whizz past. Runners huff puff past. Trains chug chug past, along the elevated bank to my left. The river meanders past, on its self determined course at the bottom of the slope to my right. These green and blue threads now weave wellbeing boosting arteries through our busy cities, having reinvented themselves in the modern age. Accessible spaces to take a breath. Just what I need today. After a time walking upstream, I have reached the edge of the city. The towpath traffic is lighter, trains are distant and the river gurgle audible. Waterfalls form as water flows out of the narrow gaps in the timbers at these ancient locks. Birds sing and dance through the air, zig zagging from bank to bank. Mandarins paddle serenely. Kingfisher corner: where the blackbird bounced and my electric blue friend bolted. As I pause to listen at one of the lock waterfalls, a blackbird catches my eye on the opposite bank as it seems to bounce in mid air without wings, as if imitating a hovering hummingbird. The invisible and slight branch it sits on springs back and forth in the wind creating this optical illusion. I can hear more singing and see more dancing birds at this spot than anywhere else along the canal. A bubbling riverlet runs water down and around this high lock, oxygenating and whitening at its re-entry to the canal. Maybe this injection of energy draws life to gather; offering a more natural untidiness. Just as the thought occurs to me, out from its graffiti backed hiding place springs an unmistakable electric blue kingfisher, turning its shimmering back to me as it speeds up the riverlet. Against the drab concrete wall the luminous colour is striking and takes me aback. A split second later and it's gone - around the lock and out of sight. After a few minutes waiting beyond the lock in the hope of another jolt of blue, I conclude it has gone into hiding and move on. Satisfied with that unexpected moment of joy and with a smile on my face, I turn and retrace my steps back to my starting point. From then on the day is brighter.